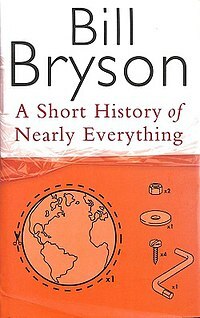 I picked up this book, A Short History of Nearly Everything by Bill Bryson, at the Amsterdam airport for the long flight back to the U.S. It’s a good read, covering the stories of important scientific findings in physics, biology, chemistry, geology, paleontology and more, often digging into the stories of the scientists themselves. I’d recommend this book if you’d like to catch up on a wide range of sciences (and the last time you thought about science was in high school 20-30 or more years ago!). 1. Scientists can be a strange, obsessive bunch. 2. New ideas are frequently rejected initially, even those which seem to do a much better job of explaining the known facts better than existing ideas. 3. Scientists frequently express great certainty, which is frequently unwarranted. 4. There’s still a whole lot we don’t know! Reining in the "Imperial Presidency"? ANDREW BACEVICH: No. I mean, people run for the presidency in order to become imperial presidents. The people who are advising these candidates, the people who aspire to be the next national security advisor, the next secretary of defense, these are people who yearn to exercise those kind of great powers. They’re not running to see if they can make the Pentagon smaller. They’re not. So when I – as a distant observer of politics – one of the things that both puzzles me and I think troubles me is the 24/7 coverage of the campaign. Parsing every word, every phrase, that either Senator Obama or Senator McCain utters, as if what they say is going to reveal some profound and important change that was going to come about if they happened to be elected. It’s not going to happen. I think we’ve gotten a hint of this lately with McCain’s aggressive comments with regard to Russia’s actions in Georgia, but I have no doubt Obama & team yearns to likewise wield government powers (perhaps in a slightly different way than McCain would, but in the end not so different). Ambitious people rarely take any pleasure in dismantling things, even when they clearly aren’t working very well. Well worth reading the whole interview. 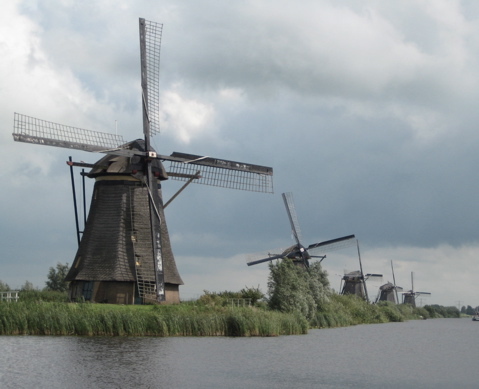 Yesterday I rode out to Kinderdijk near Rotterdam, a spot where about 20 old windmills still stand. They were built in 1738-1740, and were built so families could live in them. They were used to move water. As you can see, the wind power idea hasn’t changed a whole lot in nearly 3oo years. And while on the topic of wind energy, I noted this in Sunday’s column from Tom Friedman (who I don’t always agree with, but I think he’s right on about energy these days), where he writes on Denmark’s success with wind energy. “Today, one-third of all terrestrial wind turbines in the world come from Denmark.” [Connie Hedegaard, Denmark’s minister of climate and energy, quoted] In the last 10 years, Denmark’s exports of energy efficiency products have tripled. Energy technology exports rose 8 percent in 2007 to more than $10.5 billion in 2006, compared with a 2 percent rise in 2007 for Danish exports as a whole. Because it was smart taxes and incentives that spurred Danish energy companies to innovate, Ditlev Engel, the president of Vestas — Denmark’s and the world’s biggest wind turbine company — told me that he simply can’t understand how the U.S. Congress could have just failed to extend the production tax credits for wind development in America. 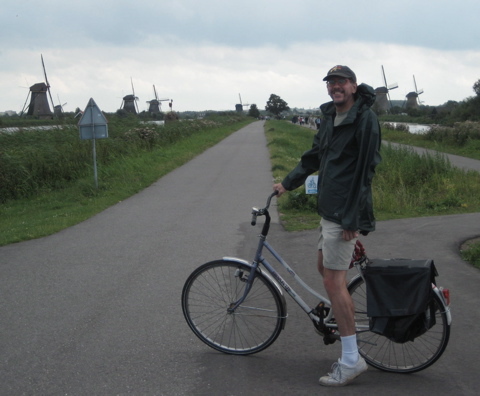 In recent years his interest in bicycles has expanded from riding them to thinking seriously about the role they play in urban life, as he has started making connections with politicians and international design consultants keen to keep cars from taking over the city. So when the Department of Transportation asked him to help judge a design competition for the city’s new bike racks, he eagerly agreed — so eagerly, in fact, that he sent in his own designs as well. Did the most powerful mayor in the nation really have to issue a stay of execution? Did some big-rig interest group push the design through in the middle of the night? Ms. Sadik-Khan insisted there was no such drama. “Mudflap Tammy” made her debut along with the other racks. By the way, you can get a free track “Strange Overtones” from the forthcoming David Byrne/Brian Eno release, entitled Everything that Happens will Happen Today. Above is (my photo of) a painting of what the Utrecht Dom presumably looked like in 1674, just prior to the big storm that knocked down a good portion of it. The Dom was built on a bit of high ground that was earlier marked out by the Romans in around year 50. Here is a graphic map of the area around the Dom with markers of buildings and walls that existed at various times. The outside border with the rounded corners marks the Roman settlement, called Castellum Trajectum. I live near the upper right corner of the map. The Dom tower is marked by the two rectangles over toward the left side. The portion in the middle marks the area that was destroyed in 1674. Next is a representation I found today of the Dom built out of sand! The border visible in the street at the bottom marks the boundary of the old Roman settlement (this is a view from the north), and by next year they will be putting that marker in place all around the Dom area. Here are a couple more then and now shots; first a photo from about 100 years ago along the old canal, with the Dom tower. And a shot today from a bit closer to the tower. Update: a couple days ago I finally climbed the tower – it’s about 96 meters high, which translates into some 460 steps. You can go all the way to the top – the level right at the top of the photo above! It’s quite a view over the whole area. I also learned a bit more of the history of the tower – it was actually built over 60 years from 1320 to 1380, after the rear part of the church was built. It was only a couple hundred years later that the rest of the church was finished.